These are interesting times to be discussing investment advice. For those who invest in wine (without even discussing the rigours of the en primeur market), there has been nothing short of a deluge of stories about fly-by-night wine investment firms using high-pressure sales tactics on stock that never existed. For those who are simply investing for retirement, a new regulatory landscape that was introduced on 6 April has opened up incredible opportunities — and a great deal of uncertainty as well. Right now you are probably wondering how these two topics are related. With interest rates and bond yields at low levels, investors have been clamouring for yield wherever they can find it, particularly those nearing retirement. Given how alternative investments — such as fine wine — have received a great deal of press over recent years for the returns they have achieved, it stands to reason that they have attracted many an amateur investor. But as someone who used to be a financial journalist and today works somewhere in asset management, these are areas of investing that are best left for the experts and those who can afford them. 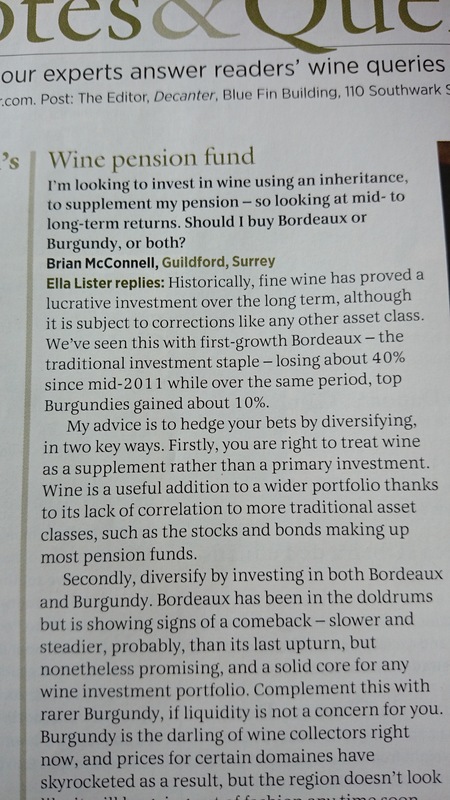 So when I noticed that the Q&A column in the May 2015 issue of Decanter magazine featured advice on how best to supplement a pension income by using an inheritance to invest in wine, my curiosity was immediately piqued. I’m looking to invest in wine using an inheritance to supplement a pension — so looking at mid- to long-term returns. Should I buy Bordeaux or Burgundy, or both? Ultimately, what someone does with their inheritance is their business. If they want to splash out on a case of Le Pin 1982 or even a whale tanker of rough-and-ready Vin de Pays, that’s their decision. But where I start to grow concerned is when that flight of fancy transforms into something more serious, such as an appeal for genuine financial advice. Perhaps only a financial wonk such as me would pick up on the distinction between wine investment advice and pensions advice, but there we go. For safety’s sake, the mere mention of the words ‘pension’ and ‘wine investment’ must be approached with caution. In fact, anyone asked to advise on a scheme where the two could be combined is faced with a minefield. Better to retreat to safety than to risk a fatal misstep. Historically, fine wine has proved a lucrative investment over the long term, although it is subject to corrections like any other asset class. We’ve seen this with first-growth Bordeaux — the traditional investment staple — losing about 40% since mid-2011 while over the same period, top Burgundies gained about 10%. My advice is to hedge your bets by diversifying, in two key ways. First, you are right to treat wine as a supplement rather than a primary investment. Wine is a useful addition to a wider portfolio thanks to its lack of correlation to more traditional asset classes, such as the stocks and bonds making up most pension funds. The central issue I am highlighting here is that, in the highly regulated world of financial advice, fine wine is an unregulated asset class so symbolic of the wild frontier of the investment world that it has attracted disapproval from the Financial Conduct Authority. Ask your financial planner to include wine investment in your retirement funding arrangements and the answer will be simple: No. If professional advisers won’t touch it, then it’s probably a good idea that the amateur financial advisers not do it either. There was no statement at the outset that, above all, the reader should seek professional financial advice before making any major investment decision relating to inheritance and a pension (we don’t know how much money this person wants to invest, but there is some suggestion it is more than a few thousand pounds). Fine wine is touted as providing lucrative returns over the long term without any specific reference to actual performance figures. While the suggestion that fine wine has a “lack of correlation” to other asset classes is not necessarily incorrect and, indeed, there are no clear indicators for fine wine prices. There is, however, evidence to suggest wine is correlated with major global economic events, such as the 2008 global financial crisis or growth in the emerging markets. While it might not move in lock step with stocks and bonds, wine as a luxury product will be affected by the vagaries of the economy in one way or another, particularly during a recession or a decline in spending. While Paul Lewis, host of BBC’s Moneybox, rightfully wrote that anyone can given financial advice, not just qualified financial advisers, there are times when it’s best left for the experts. I do not dispute the wine investment expertise that Decanter provided to this reader. I just believe that it should have been more careful given this person’s clear need for pensions advice. Like what you see? Subscribe for email updates whenever a new post is published!